We have recently completed the fabrication and installation of a portion of the master planned vehicle directional monuments for Benderson Development. 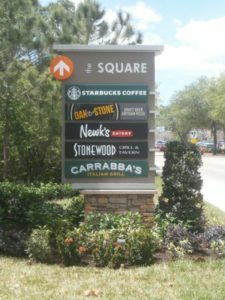 These directional signs assist motorists in locating specific tenants, centers and office campuses that make up part of the greater University Town Center development. The signs are all aluminum fabrication. filled and finished with an Matthews acrylic polyurethane paint presenting a seamless architectural quality appearance. Tenant panels are attached with concealed mechanical fasteners and decorated with 3M High Performance opaque vinyl graphics. Currently four signs are installed with three waiting completion of road construction projects to make their debut.